I wanna take this opportunity to clear something up from the previous update. As a carnivore, Selkie’s “allergy” to grains vegetables and fruits is really just indigestion since she can’t successfully digest them. They’ll give her an upset stomach and induce some vomiting/diarrhea, but with a handful of exceptions (such as peanuts) they aren’t toxic necessarily (although vomiting/diarrhea is still a great reason to avoid them!). Small amounts of sauces and seasonings, taken with meat, don’t cause a problem; so she can have things like teriyaki jerky without concern. Todd stating he “didn’t have any food that won’t kill her” was more of an “oh crap” reaction than anything else, and Selkie comparing the bleu cheese to poison is just because she thinks it tastes terrible. 😀 Had she swallowed it instead of spitting it back into her hand, she would’ve been fine. Thank you Jinx! It’s adorable! “…yellows.” Yeah, that’s a response I would have used a few years ago. Come to think of it, I usually give a color as an answer when I’m asked what kind of salad dressing I want. My dad used to ask us what color of ice cream we wanted – brown, white or pink (occasionally green). Orange. It’s the only way to go. Reminds me of my time spending summers with my Godmother. There was a lady across the street selling Frozens (basically styrofoam cups of frozen Kool-Aid) for a quarter each. I’ll always remember this one kid standing in line with the rest of us who always said he wanted “Red” flavor, despite having Tropical Punch, Strawberry and Cherry flavors available. I love this story and have re read it like 5 times now (very board at work heh). I like the characters and the settings. Skelie is such an interesting girl and I am surprised with all her special needs reading glasses aren’t on the list. Look forward to the shopping trip! Hell, when I was a wee one Selkie’s age, I thought Cheerios tasted like the color Green. The way Selkie looks and the anatomical drawings that you did of her species remind me of Hoshigaki Kisame from Naruto (except for the hands and feet of course). Wow…..he looks like a kid….like A LOT, I thought for a second that he was a kid from the orphanage…. True, we all are. I still whine and beg for candy and new video games, lol. Cute comic today! And the fanart is adorable! Wait, “chili dogs”? She is allergic to beans AND white bread! Well, if he bought them hot off a hot dog cart, yeah, I could see that being an issue. But if he makes the chili dogs himself to go on a plate, he can skip the buns, and some chilis work fine without beans. Yeah, I’ll have to make you mine some time. I enjoy seeing the fanart, but this one stands out. Sorry everybody else, good as they are, I just love Selkie’s expression here. For some reason she just looks more like a little girl. @Jon, you can have chili without beans, though I’m not sure about all the plant derived spices- I’m guessing she has some tolerance but can’t derive the bulk much nutrition from plants. also i have a friend who is gluten intolerant (so nothing with wheat which means most breads are off limits) so she eats stuff without the bun. Awesome fan art! Any chance you can get that girl to draw your strips? I’d rather not outsource the artwork. @Jinx – I suppose so. Either your username or your drawing style. I didn’t really think about it. I love the way you drew Todd’s messed up hair! I thought he’d wear the business man hair do 24/7. I was also thinking Selkie’s eating habits were like other carnivores, they pick up their veggies from the animals they eat since they have the enzymes to digest vegetables and what nots. yay animal planet! I love the fan art! So kawaii! Has no one posting on this thread have a cat? Cat’s are just carnivores too, but they’ll still eat grass. If they eat too much, they puke and get diarrhoea, but in small quantities they’ll pass it, just mostly undigested. The indigestion, puking, and diarrhoea comes from the body realizing there is something in the digestive tract, and trying to get rid of it. If you account ratios, the quantities of grass to cat stomach would be more than plant quantities to girl stomach. TL:DR: Beans and buns would not make a carnivore Selkie’s size vomit. Various people posted the cat analogy on a previous comic thread I think, and I think it’s mostly applicable. However, Selkie’s digestive system could easily be much more intolerant than a cat’s; I still wouldn’t expect small bits (like her taste of blue cheese) to make her throw up, but with as much bread as is involved in a bun and/or the amount of beans in a chili with beans, she’d probably get a most unpleasant queasiness if she didn’t outright vomit. Of course, she could just have the chili dog without the bun, using a chili with no beans (a “proper” chili, by aficionados’ standards), topped with cheese, and this should make her happy! True, she is a child after all. And bean chili is fantastic if you’re poor and can’t afford lots of meat. maybe they can get sourdough hotdog buns it wasnt on the list and to my knowledge it not white, wheat or rye? I wonder who Andi is… it’s probably important or else it wouldn’t have been added into the strip. My guess is that Andi is the person (gender indeterminate) who “used to be a good friend” from #49. I think he has important information on Selkie. Why? 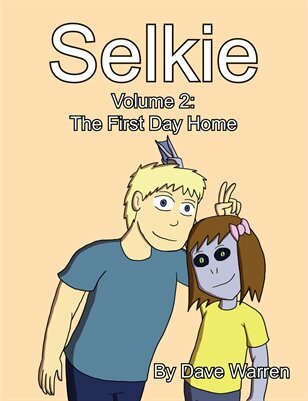 The only people who know about Selkie are those at the Orphanage…And he doesn’t know them by first names. That there’s a name on the phone means that the number is programmed into it, so it has to be someone he already knows. Looking at page 273, how many fingers (and toes) does Selkie have? Selkie has 4 fingers and 3 toes. The fan art is great! It kind of reminds me of Flim Flam from the 13 ghosts of Scooby Doo! I KNEW IT WAS A GUY! Now, when is Todd just going to come right out and tell us that he used to be/is gay? Nothing to be ashamed of. Andi is usually short for Andrea….